Dr. Raj Singh teaches in the School of Business Administration at UCR, where he recently received the Golden Apple Award for Teaching Excellence. He holds several advanced degrees from universities in India and the U.S., including a Ph.D. in Policy Planning and Administration from USC. Raj teaches courses in organizational behavior, introduction to business, human resource management and leadership development. He has co-authored a textbook in Crime Analysis, and has published several articles and reviewed and edited journals in the field of management. In addition to his academic career, Raj has held a variety of professional positions in engineering and management. See his full bio here. Insider: Do you have a favorite axiom for business management that you like to share with your students? R.S. : It is a good policy for management to be fair and ethical in dealing with employees. In the long run, you will be very successful in creating a very productive organization. Insider: What do you enjoy most about teaching at UCR? R.S. : I enjoy interacting with our students and unlocking their potential to contribute to positive social change. The other aspect of teaching I enjoy is keeping up to date with developments in my teaching area. Insider: The School of Business Administration recently awarded you the Golden Apple Award for Teaching Excellence. Congratulations! How does it feel to have your teaching recognized by the Management Program and the School of Business? R.S: This award was created specifically to recognize teaching excellence in the School of Business Administration by our leadership. It gives me great pleasure to know that our administration and students recognize and value teaching. Insider: You've been a lecturer and a union member at UCR for many years. Why is the union important to you? R.S: The work of the union is important to me because it has provided job security and other benefits which have a direct relationship to my teaching. For example, I have been awarded professional development funding to complete the Executive Certificate in Leadership and Management at MIT's Sloan School of Management. My students have benefited greatly from the knowledge I acquired due to this financial support. Based on my experience, the union has been very supportive of professional development for lecturers over the years. Insider: How have you been involved with UC-AFT at UCR? R.S: In the past, I have served as a member and committee Chair of the "Professional Development Fund" committee at UCR. As I mentioned above, this fund has been really important for lecturers. This year, I will be taking on a new role as an Organizing Fellow with UC-AFT. The Fellows are a statewide team of UC-AFT members who facilitate trainings on local board development and organizing approaches that really value self-determined participation and union democracy. Insider: You teach management and you publish and review management journals. You're also a union member. Is there any conflict between the management principles you teach and your experience as a union member? R.S: No, I do not find any conflict. I teach my students that it is very important to maintain good relationships between employees and management in any organization. I have worked in industry where I experienced working relationships with and without conflict between management and employees. It is my view that good management means developing good relationships between unions and management for organizational effectiveness. Insider: The Business School lists lecturers along with senate faculty members on the faculty webpage. They have also opened the teaching award to lecturers. Kudos to SoBA! These things demonstrate a certain amount of respect and inclusion for non-senate faculty. How important is this for you and your non-senate colleagues? R.S: I have been with the School of Business Administration for many years and lecturers were not always included in the School's website or any other activities. However, our new Dean is very inclusive of lecturers not only in our website but other activities as well. I feel inclusion of lecturers has contributed to improved working relationships with senate faculty. After all, lecturers and senate faculty have at least one common goal of providing an excellent teaching experience to our students. Insider: What do you enjoy doing outside of your work at UCR? R.S: I like to travel and spend time with my family. 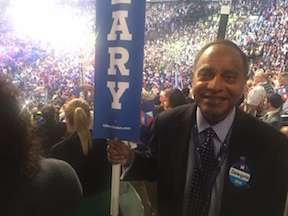 In addition, I serve as a Controller of Riverside County Democratic Party and I was able to attend Democratic National Convention Held in Philadelphia in July this year.